I picked up the latest edition of Wired UK yesterday and when I started to read, one of the first articles looked surprisingly familiar. Turns out that the article about the Xbox media mogul also appeared in the October issue, only with a slightly different introduction. 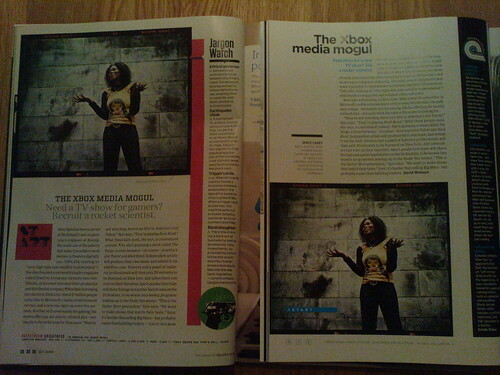 Update: After discussing the matter on Twitter, I realized that the first time the article appeared was actually in the U.S. edition (Oct 2009) and the second time in Wired UK. So I guess this was not quite as weird as I first thought. On the other hand, here in Sweden the stores sometimes have the U.S. version and sometimes only the UK, so if articles are recycled two months later, there will be a risk that this will happen again. Tags: wired, media, uk, media, wired. Ping. For this year’s Los Angeles Design Challenge, Audi turned to social media for ideas and input on the design of new cars. Audi invited the community of nearly 400,000 Audi fans on Facebook to interact and come up with suggestions for the design of a Youthmobile that would come out in the year 2030. 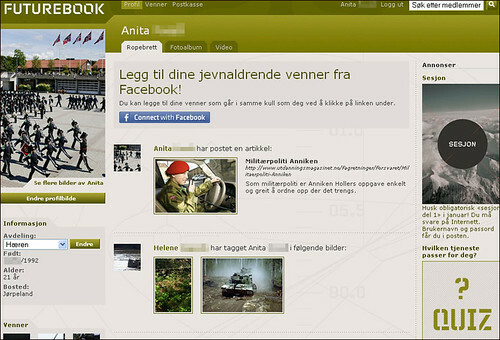 Designers engaged with fans in a numbers of ways, such as discussion threads, polls and feedback on photos and videos. The challenge resulted in two concept cars: Audi eSpira and Audi eOra. More images and videos can be found via the Audi fan page on Facebook. Tags: audi, facebook, design, design, audi, facebook. Ping. Foursquare is a location-based social network with gaming elements, and it is the latest hype among tech savvy social media users. Its mobile app lets you check-in at different venues and find out where your friends are. Today the site added 15 new European cities (not 14 as published on TechCrunch) to the two existing, London and Amsterdam. Stockholm is one of the new cities that is available as of today. The other cities are Athens, Barcelona, Berlin, Brussels, Copenhagen, Dublin, Helsinki, Geneva, Madrid, Munich, Manchester, Paris, Prague and Rome. Tags: foursquare, mobile apps, stockholm, mobilapplikationer, stockholm, foursquare. Ping. Canadian singer Dave Carroll became an instant hit on YouTube when he recorded and published the song “United Breaks Guitars”. The video describing how United Airlines broke his guitar, has been viewed 5.8 million times and has become a great case story for how consumers are putting pressure on businesses via social media. To add insult to injury, apparently United once again managed to mess up a trip for Carroll. The New York Times writes that United lost Carroll’s bag on a recent trip to Denver. In an interview, Mr. Carroll said that for more than an hour on Sunday, he was told he could not leave the international baggage claim area at Denver International Airport, where he had flown from Saskatchewan. He said he had been told to stay because his bag was delayed, not lost, and he had to be there to claim it when it came down the conveyor belt. “I’m the only person pacing around this room,” Mr. Carroll said, recalling how he was caught between an order from United staff members to stay and collect his bag, and a federal customs official telling him he had to leave the baggage claim area. The bag never showed. Social media like blogs and Twitter enable individual consumers to voice their opinions against brands and companies. From a consumer perspective I think this is mainly positive because it gives consumers more power in a relationship that previously was dominated by companies. David is closing in on Goliath. And most incidents where bloggers write really negative comments about brands, they are doing it as a last resource. They’ve tried all the normal routes for customer complaints without success and eventually make a final effort by taking their anger out on their blogs. Norwegian blogger Vampus today blogged about the Carroll/United kerfuffle. She writes that social media can be used as black mail against politicians, businesses and organizations, but where only part of the truth is revealed. That may very well happen from time to time, which is why companies must not automatically surrender to criticism just because it is published on a blog. The customer is not always right and if you believe the blogger does not have a case, you should say so. A terrific example of an organization that faced serious allegations from a blogger, and handled it well, is the TSA, the U.S. Transportation Security Administration. In a blog post headlined “tsa agents took my son”, a blogger claims her son was taken away from her during several minutes by TSA agents at Atlanta Hartsfield-Jackson airport. But the TSA did not just apologize or admit wrong-doing just like that. Instead it investigated the accusations and published the findings on its blog, with CCTV footage and everything (first one video, then nine other from different angles), which showed that the claims were not true. As a result, the blogger backed down and apologized. I think TSA would not have been able to respond so cleverly if it had not had a blog, so if you are looking for arguments why your organization should start a blog, that might be one. All in all, consumer complaints on blogs and other social media channels are going to increase (a new example today in Sweden from a blogger attacking the bank Nordea). Businesses need to monitor such comments and manage some, but there is no need to panic. With a decent strategy in place you can even survive an attack from a blogger. Tags: tsa, blogs, bloggar, makt, utpressning. Ping.